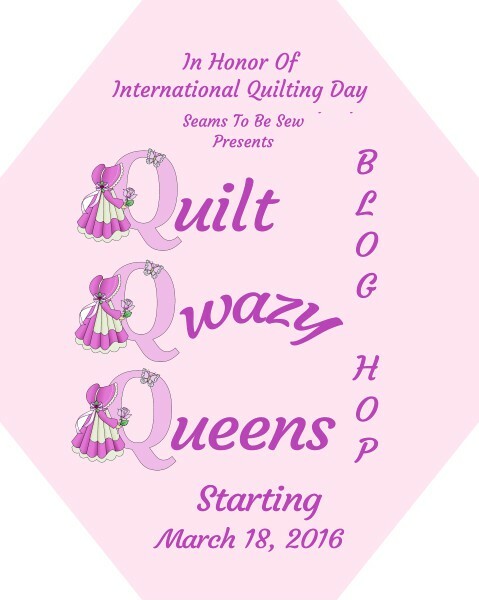 Today is International Quilting Day. In honor of International Quilting Day I spent most of the day quilting and sewing as any true Quilting Queen would do. I spent some of the day doing the next best thing, junkin. I went to 2 Estate Sales and 1 yard sale sale and a trip to Goodwill. However, the junkin lords weren't with me today. I didn't buy one single thing! Oh well, I still love doing it. Here is what I finished today. This pattern is called Kiss In The Corner by Bonnie Hunter. It's a free pattern on her website. You can find it here. I started this quilt at the retreat last July with Bonnie Hunter and Jo and Kelli Kramer. I took it on another retreat in August and made more progress. Then I took it on my retreat in January and I made even more progress. I was getting so close to getting it finished. Then I decided it needed to be bigger... just a little bigger.... I wanted it twin size. I had quite a few 9 patch blocks left over and I had 4 of the churn dash blocks left over. Yes, I know there are only 3 in this photo, but really, I had 4 left over. While I was at Hollie's in Arizona in February, I made more 9 patch blocks, sewed them together and added them as the second border. I didn't quite have enough so I couldn't finish the last side. Sooo... today I made the remaining 9 patch blocks. Then I framed the churn dash blocks with the final border fabric. The blocks were only 4 1/2" finished and my final border needed to be 6" finished. Finally! The final border is on and it's ready to quilt. I loved how it turned out. And I couldn't be happier to have this UFO complete! Now it goes into the Flimsy pile to be quilted. I'd say this finish is a great way to spend International Quilting Day. 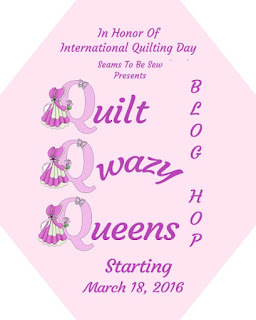 And speaking of International Quilting Day, there's a blog hop going on in honor of International Quilting Day. It's the Qwazy Quilt Queens. You can see the full details here. My day to share is next Friday, March 25th. Too much quilting for me. I'm one of those people that want to get it done before I move on to something else. So I stick to throws and baby quilts. Plus I fmq on my small machine.